I remember when I first heard about the re-enter and roll. I thought it was illogical. If I knew how to roll why would I be out of my kayak needing to re-enter and then try to roll. If my roll didn't work the first time, why should I think it would work the second time, especially with a cockpit full of water? Over the years I have ended up in situations where a re-enter and roll was the perfect recovery given the circumstances. I once had to swim into a cave to retrieve an abandoned kayak. It was much easier and faster to re-enter the kayak and roll up and paddle it out of the cave than trying to swim the kayak out. More than once I was ripped out of my kayak by the force of a wave and getting back in and rolling up was the best way to get out of the surf zone quickly. I also found that practicing a re-enter and roll was an excellent confidence builder as I strived for the so called "bomb proof roll." If you find yourself without a paddle float, the re-enter and roll is one of your few remaining options in the solo recovery category. When I decide the re-enter and roll is my choice of solo recovery, here are the steps I take to perform the skill. 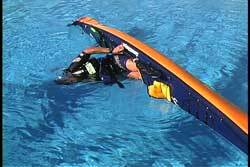 Whenever I wet exit and wish to maintain contact with my kayak, I usually keep one leg in the cockpit of my overturned kayak to hold on to it so I have my hands free for other chores. In this particular recovery method it is a great lead-in, because your second leg will soon follow. Be sure you are facing the bow. 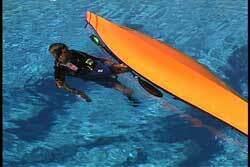 It is vital you position and hold your paddle correctly as you set up and re-enter the kayak. I hold my paddle on the surface parallel to the kayak with the power face reflecting the ocean bottom. In these pictures my left hand is holding the cockpit coaming and the paddle at the same time. My four fingers are between the coaming and the deck and my thumb hooks the paddle shaft and then grips the inside of cockpit. Now the paddle and the cockpit coaming are in my grip. When I am ready, I put my second leg into the cockpit. I am getting ready to slip back into the seat. I want to get as much of my body into the cockpit as possible and still keep my head above water. My goal is to minimize the time I need to spend underwater. Since I am planning to do a planned immersion it is an excellent time to use my nose clips. I have found, in this day and age, water quality is an oxymoron. The less water you get up your nose the better, given the pollution and bacteria that exist in most of the places we now paddle. In addition I strongly believe that one's breath holding capacity is increased significantly when using nose clips. Nose clips also reduce the discomfort and panic feeling some experience from being upside down with water up their nose. 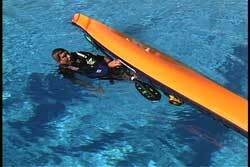 When you are ready to go underwater, take a breath and reach your free hand around to the other side of the coaming so you can use both hands to pull yourself back into your cockpit and put your feet on the foot pedals with your knees and thighs under the braces. It is important that you are secure in your seat. Your goal is to be sitting in your kayak upside down as if you were right side up. This sounds a lot more dramatic than it is. 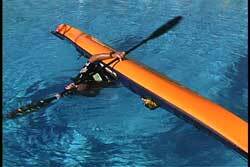 Since you are almost weightless in the water getting into your kayak is not difficult. I have found the easiest way to do it is by lifting the kayak up a little and slipping in from the side rather than going upside down to get in. My hands grab the cockpit coaming on either side so I have the leverage to pull myself into the seat. If you are not a fan of nose clips you can also practice GENTLY exhaling through your nose while underwater to keep the water from coming in. Since you will not be under for a long time a slow exhale can do the trick. As I mentioned earlier, I prefer to hold my paddle when I do this maneuver. If your hands cannot hold the coaming and the paddle, you can keep the paddle between your arm and your body when you begin this maneuver. The paddle will end up near your hand when you are back in the kayak while upside down. Finding the paddle will be easy because it will be between your arm and your body. Once you are securely in the cockpit grab the paddle with both hands in your normal rolling position. Then reach your hands toward the sky to be sure you are starting the rolling motion with your paddle blade near the surface. When ready, execute your most reliable roll. 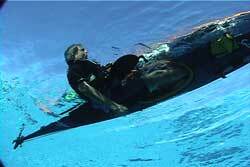 See USK web site article "Extended paddle roll (Pawlata Roll)" for a roll with more leverage. Once you are back in your kayak seat, you should be ready to follow your normal rolling procedures. The only difference will be a sluggish response from the kayak when you roll due to the extra water in the cockpit. Keep in mind your cockpit acts as a giant ladle scooping up water as you roll up. I have played some games with my staff over the years increasing the degree of difficulty when practicing this skill. If you can hold your breath long enough, try attaching your skirt when underwater. This will reduce the amount of water that enters the kayak. There is a practical side to attaching the skirt underwater in certain circumstances. 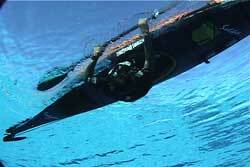 If you are fast enough and you are going to be rolling up to conditions that will wash more water into your open cockpit, then attaching the skirt underwater is advantageous. As soon as you roll up, you are ready to paddle and not have to worry about putting on your skirt and bracing at the same time if the conditions are rough. Water sloshing from side to side in your cockpit causes instability. Being able to roll up and paddle off is a nice advantage. Keep in mind this requires more breath holding time. Also, the colder the water the more difficult it is to stay underwater without a thermal hood. In this instance I am executing a C to C roll. As I mentioned earlier, you can use you can chose any roll in your arsenal. The goal is to get upright so use your most reliable roll. Again, the open cockpit will scoop water so your roll will feel a bit sluggish compared to your roll when you spray skirt is attached and your cockpit is empty of water. 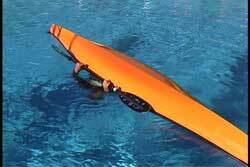 Once you are upright you now have to deal with the conditions that caused the capsize in the first place. You also need to attach your spray skirt and pump out the water. If you have practiced paddling with a cockpit full of water then you will have more options. See USK web site article "Paddling A Flooded Kayak" for more detailed instruction. I once heard of some east coast winter paddlers who would practice this skill by wet exiting out of their spray skirt tunnel leaving the spray skirt attached to the kayak. Then they would try to re-enter through the tunnel and then roll up. The idea was to reduce the amount of water entering the cockpit. (I also believe this variation was a rite of passage amongst some friends). 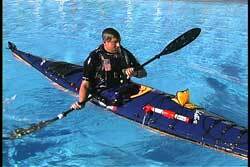 It seems like a nice practice exercise for control, but doesn't seem very practical because wet exiting with your skirt attached to your kayak is not the norm. My spray skirt tunnel is under other layers of clothing and the support straps are also under garments. My skirt goes with me when I wet exit. As I have mentioned many times before, the more options you have in your bag of tricks the better prepared you will be for challenges that come your way. The re-enter and roll is a skill that is not often needed, but it is a great skill to have when the right circumstance presents itself. For those of you who have a reliable roll, try practicing the re-enter and roll to test the reliability of your roll and to expand your horizons. Pictures seen above were taken from the USK Video "Capsize Recoveries & Rescue Procedures"